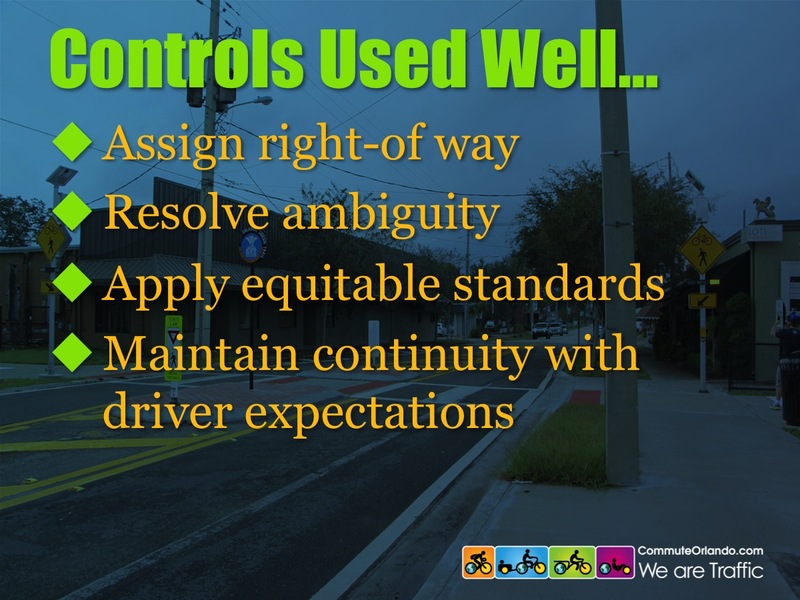 In March, I shared a presentation I gave to the Metroplan Orlando BPAC highlighting the misuse and overuse of stop signs on our MUP (multi-use path) system. After that, I was asked to present to the Management & Operations subcommittee. The presentation was very well received and it was agreed that the issue should be addressed. A Trail Traffic Control Working Group was set up. 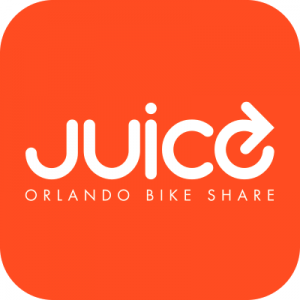 We began meeting in September and will meet monthly on the 3rd Thursday. Below is an overview of the process, challenges and possibilities and what you can do to help. 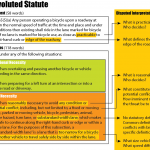 01 State or local laws written in accordance with the “Uniform Vehicle Code” (see Section 1A.11) establish the right-of-way rule at intersections having no regulatory traffic control signs such that the driver of a vehicle approaching an intersection must yield the right-of-way to any vehicle or pedestrian already in the intersection. When two vehicles approach an intersection from different streets or highways at approximately the same time, the right-of-way rule requires the driver of the vehicle on the left to yield the right-of-way to the vehicle on the right. The right-of-way can be modified at through streets or highways by placing YIELD (R1-2) signs (see Sections 2B.08 and 2B.09) or STOP (R1-1) signs (see Sections 2B.05 through 2B.07) on one or more approaches. Stop signs at streets with less traffic than the trail. Stop signs at private driveways. The path is a public right of way. It has priority over a private driveway. Stop signs on sidepaths where the intersecting street traffic is required to stop or yield before entering the adjacent roadway. That traffic is required by statute to yield to traffic on a sidewalk or sidepath. Stop signs where sight lines are sufficient for yield signs. “Walk bike” regulatory placards which are not supported by any statute, thus not legal. In a perfect world, one could look at all of the above intersections where the stop signs are clearly unwarranted and simply yank ’em out. But this isn’t a perfect world. This is a world governed by layers of bureaucracy, frozen by fear of litigation and public backlash. Like it or not, that’s the system we’re working with. Risk Management Pucker Factor: Despite the fact that failing to use established guidance should be what opens you to liability, the fear is that changing something — even something that is wrong — will create a liability problem. If we remove a stop sign and someone gets hit, the personal injury attorneys are going to hone in on the deepest pockets they can find. So, we need more justification for a decision to remove unwarranted stop signs than the guidance that should have prevented their installation in the first place. One method is to support the cause with crash data. But there are some challenges with this: 1) crash data makes up a tiny fraction of overall conflict experience; 2) the tell-tale crash data will not be at the intersections with the unwarranted stop signs, it will be at downstream intersections where stopping path traffic is more likely warranted. The main safety issue is that unwarranted signs habituate people to ignoring signs. Mighk has complied crash data for the prioritized paths. There is evidence of the correlation we expected — high crash counts at Cady Way Trail and Baldwin Park Street follow a section of path where there are 6 stop signs at minor intersection in 1,500 ft. 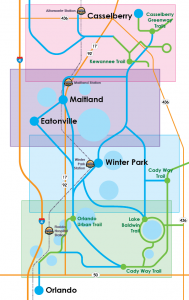 There is a similar pattern on the West Orange Trail. Another safety issue that is impossible to count with crash data is created by a pattern of compensatory behavior. 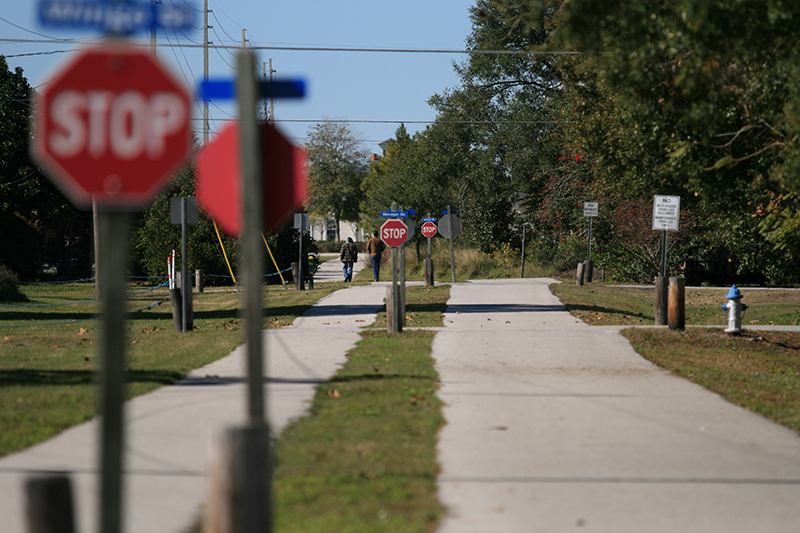 In many places, motorists who are accustomed to bicyclists running the stop signs are stopping and waving bicyclists through all-way controlled path intersections. 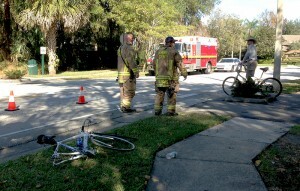 The bicyclists who use those intersections regularly become accustomed to this. This habituates regular users to operate based on assumptions rather than in response to clear guidance. It’s all in good fun until one motorist doesn’t get the memo on this unwritten protocol. Public Input & Potential Backlash: Another problem we have is the widespread and not-unwarranted perception that bicyclists ignore stop signs. Removing unwarranted stop signs is likely to be viewed by the non-cycling public as rewarding scofflaws. It’s pretty much impossible to make the nuanced point that overuse of stop signs where they are not appropriate increases the propensity to ignore them. Even typically law abiding bicyclists are not going to stop every 500 ft at a bunch of dirt driveways. Behavior counts. It’s hard to have a conversation on behalf of bicyclists with people who have routinely been run off the path or had the crap scared out of them by reckless bicyclists. These are the people who will show up at a public meeting to oppose removal of stop signs. So, aside from being polite on the path (as I suspect most of our readers are), we need to be willing to show up if this does come to a public input process. We will post alerts to let you know when and where. Another way you can move this process along is to add your public input now. Are there intersections where you have had problems: had close calls, witnessed close calls, where you experience confusion (deadlock of “you go” “no, you go”)? If you’ve ever had a crash that was not reported (most minor ones are not) as a result of a confusing intersection, please tell us about that too. 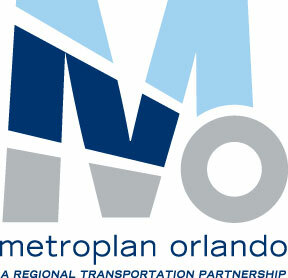 Write to Mighk Wilson (MWilson@metroplanorlando.com). You can also tell us about it in the comments. 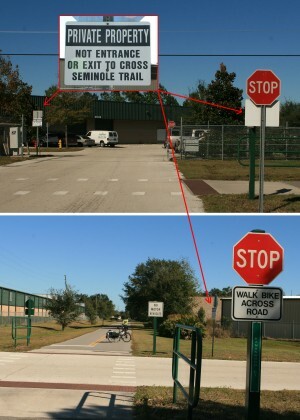 While the process for removing unwarranted signs will probably not be a short one, it is possible. All the engineers, planners and trail managers on the workgroup are interested in making it happen. Another thing to come of this endeavor will be a set of metro-wide standards for all future MUP projects. With the focus on Close the Gaps and the political support for our path network, we have an opportunity to prioritize trail traffic. For example, in The Netherlands, “chance of stop” is a design criterion. On an arterial path, the maximum number of stops per kilometer is specified as .5 (that’s one per 2 kilometers). * Cady Way would be an example of an arterial path. Right now, between Beach Street and Lake Baldwin Lane there are 7 stop signs in one kilometer. Bicyclists are intimately aware of energy loss from frequent stops. 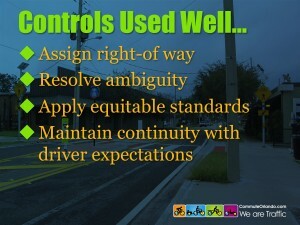 If we want to promote bicycling as an alternative, we need to promote equitable standards for stop controls. 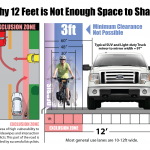 Giving right of way priority to every other street and driveway, no matter how minor, punishes bicyclists and eliminates any hope of improving bicyclist compliance. Thanks for putting this out here. I’ll definitely be looking for ways to get involved and help!! We were taking a (rare) recreational ride last weekend and took the trail less traveled – indeed, encountered a stop sign on the trail where there was none for the crossing dirt road leaving the back end of a motel parking lot leading to an empty lot next to some railroad tracks. Surely it was placed there in a form of reverse liability pucker-factor: trail designers, municipalities, the Comfort Inn, and the Burlington Northern Railroad collectively recognize that the odds of getting the ten drivers per year to actually look for cyclists and yield to them is about zero. Interestingly, I was riding on the sidewalk here yesterday (busy two-lane road between two pieces of four-lane, don’t kick me out of the efficular club :)) and noticed that the driveway has two stop signs: one at the sidewalk and the other at the road. A four-way yield would result in much more efficient travel as well as a significant reduction in noise pollution. That looks to have some geometry issues with the acute angle; a four-way yield would probably result in too many rounds of chicken. A better solution might be realigning Casco and Church to intersect Pleasant Hill at two separate intersections; the right-of-way to do this seems to be there on the west side. How awesome that you’re discussing an intersection I used to bike through all the time! I don’t remember even a yield sign, but it was well in the previous century… Go U Bears! However, I believe stop signs behind the trail, as opposed to on the road, are basically ignored… If a cyclist counts on a vehicle stopping for them, it probably won’t happen.